Angele, J., Fensel, D. & Studer, R. 1998. Developing knowledge-based systems with MIKE. 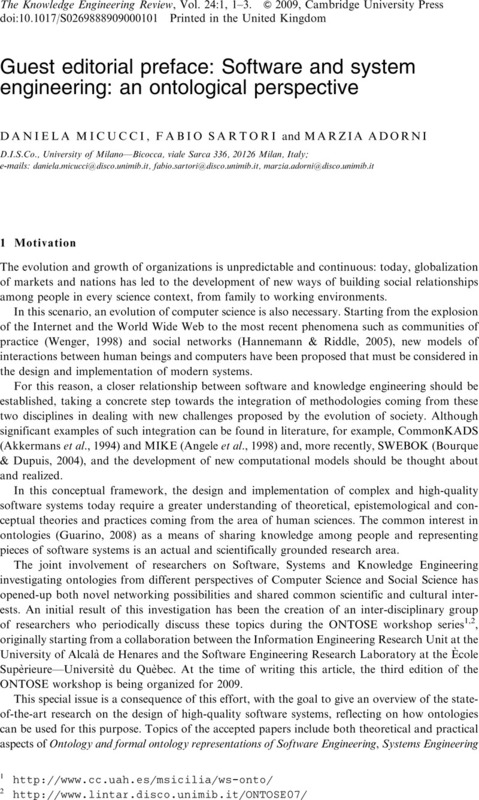 Journal of Automated Software Engineering 5(4), 389–418. Bourque, P. & Dupuis, R. 2004. Guide to the Software Engineering Body of Knowledge, 2004 Version. IEEE Computer Society. Guarino, N. 2008. Ontological foundations of conceptual modeling and knowledge representation. In Proceedings of the 16th Italian Symposium on Advanced Database Systems, SEBD 2008, 22–25 June 2008, Gaglio, S., Infantino, I. & Saccà, D. (eds). Mondello, PA, Italy. Schreiber, G., Wielinga, B., de Hoog, R., Akkermans, H. & Van de Velde, W. 1994. CommonKADS: a comprehensive methodology for KBS development. IEEE Expert 9(6), 28–37. Wenger, E. 1998. Community of Practice: Learning, Meaning and Identity. Cambridge University Press.